From some of the reviews here on the Meople’s Magazine, you might be under the impression that in order to be fun a game has to be complex. It’s true that we tend towards games with a bunch of different components, sneaky player interaction and a little rule that you only get to use once in a while, but when you remember to do it people will stare at you in awe of your skill; or maybe stare at you with pure hatred for remembering that rule. It’s true that we review games from that part of town most often. That doesn’t mean we don’t enjoy games that are very very simple – when they are also very very clever. Ken Fisher’s Wizard is one of those games. You almost couldn’t ask for it to be any simpler.Wizard is a trick-taking game: there is four suits of cards with values from 1 to 13. After dealing, one of the remaining cards is revealed to determine the trump suit. The first player plays any card from his hand, the other players then have to follow suit or, if they cannot, either play a trump to win or throw in a card from another colour to get rid of it. The trick goes to the player that had the highest trump or, if no trump was played, the highest card in the original suit. The first round is played with only one card per player, each subsequent round with one more until finally all 60 cards are dealt out on the last round, coincidentally not leaving a card to determine the trump suit. So far, Wizard would be one of those games you use to teach your 4 year old how to play with cards. There is two sets of special cards that add some spice: Wizards and Jesters. Both Wizards and Jesters belong to no suit but can be played even if you could follow suit. The first Wizard in a trick always wins that trick, no matter what other cards are in it. A Jester never wins any tricks, except in the rare case that the trick contains only Jesters – in that case, the first one wins again. If a Jester is revealed for trump suit, this round has no trumps; in case of a Wizard the dealer chooses a trump suit after seeing his cards. Still, this is nothing that would pose big problems for your average six year old and certainly not what a group of adults would spend an entire evening on. But now there is that final piece of rules that puts Wizard in the “very very clever” category and made it popular enough all over the world to have its own world championship: before the first card in a turn is played, every player must make a bet how many tricks he is going to take this round. The only way to score points is through fulfilling this bet: 20 for succeeding at all plus 10 for every trick you took. Any trick more or less than your bet not only gets you nothing at all for this round, you even lose 10 points for every trick by which you miss your bet. The most-played (and in my opinion most interesting) variant of Wizard demands that the bets of all players never add up to the real amount of tricks available, making sure that there will not be a peaceful solution. And suddenly those very simple rules come together to make a much deeper and more enjoyable game than you would expect from “simple trick-taking”. In the first two or three rounds, there still is much luck involved: with only two cards, you’re not exactly drowning in strategic options and whether you win your bet or not depends heavily on card luck. But the first few rounds are only for warming up: from round five on, you have many more options to consider and many more ways to contribute to your own success. In this phase of the game, against experienced opponents, you have to pull all the registers: sometimes you want to rid yourself of a colour that you started with only one or two cards in so you don’t have to follow suit and will be able to trump that colour. Sometimes you need to find a way to lose high cards because you find that your bet was too low. You will want to base your bet on these and a couple of other things, like the number of Wizards and Jesters in your hand, but also your distance from the start player. And sometimes you just have to recognise a truly bad hand and bet low in order not to lose points. On the other side of things, a good hand has a strong push-your-luck element where you want to try for more tricks than you’re strictly comfortable with because more tricks still means more points. And there you have it: a game with very simple rules that is nevertheless engaging and quite difficult to master. The art by Franz Vohwinkel does the rest to make Wizard attractive in all respect: the four suits of cards are each illustrated with one of the four races human, dwarf elf and giant, with the values going from a thief at one point to the king at twelve and the battle standard at 13. 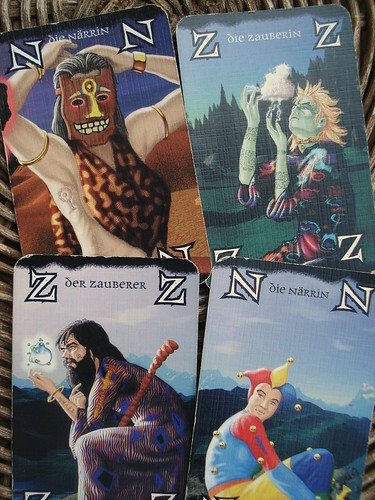 Not only is each card individually illustrated, all cards from one colour connect to a long panorama picture with a Wizard and Jester at the ends. The only bad thing I might say about the illustrations is that, if you find yourself playing in a badly illuminated environment, you better learn the symbols for each suit of cards instead of the colours because blue and green become very hard to tell apart. 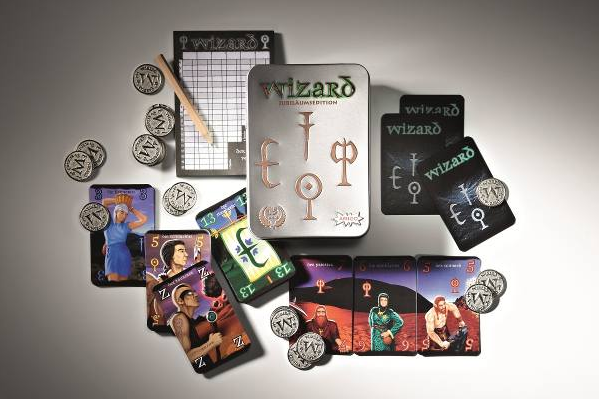 Although Wizard is an old game by board game standards – the AMIGO edition that we’re playing and that seems to be the basis for many later editions was first published in 1996 – it’s still going strong and attracting more people: just these days, AMIGO released the 15th Anniversary Special Edition in a silver tin, including a set of silver coins to make your bets that is sure to find some new fans and replace the old and battered edition of many long-term players. By the way, in countries that have the original edition first published in 1984 without the fantasy theme, the AMIGO editions are known as Fantasy Wizard. Being a merchant in the bazaar of Istanbul is a demanding job, and some days you just can’t do it without some chemical stimulation. With the new expansion to Mocha & Baksheesh, you can finally have your coffee in Rüdiger Dorn’s Istanbul. But it’s not for you to drink and gain energy for additional actions, it’s another commodity for you to trade in on your quest for rubies. But does coffee really make everything better?